disappeared at once -- he was the perfect Charlie. It's like he does puppydog eyes without even trying. Ezra Miller as Patrick! Again, perfect casting and great acting. He was loopy and funny and charismatic, and exactly the Patrick I'd pictured in my head, except with worse clothes. Some of his antics weren't in the book, but they were very good and I'm glad they put them in. A minor gripe is that the movie only scratched the surface of Patrick's dark side, but I guess there wasn't enough time for that and it wasn't quite crucial to plot development. I'm not sure if it's possible to not like Patrick. I'm sorry, but I really couldn't wrap my head around Emma Watson as Sam -- the whole movie, I couldn't shake the feeling that it was Hermione playing Sam. I mean, I know she tried and she pulled off the American accent pretty well, but all the subtle mannerisms -- the head tilt, the pained look in her eyes when she felt bad about something, the tiny-lip-quirk smile -- just screamed Hermione. It didn't help either that I had cast Edward Scissorhands-era Winona Ryder as Sam in my head. 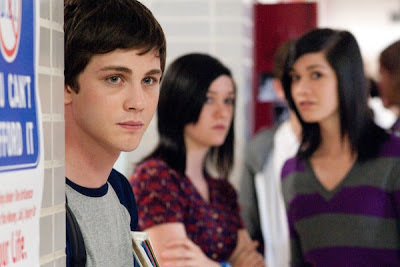 Since Mr. Chbosky directed it, the movie stayed almost completely true to the book. There were minor changes here and there to cut down on the run time, and these had been very neatly done. What had not been neatly done, however, was the censoring. It was jarring and abrupt and horrible and blatantly obvious, and I cannot wait to get my hands on the full, uncensored movie. Look at Charlie being so pleased with his newfound friends. But it isn't all depressing -- there are funny parts as well. The movie's a good deal funnier than the book, I think. 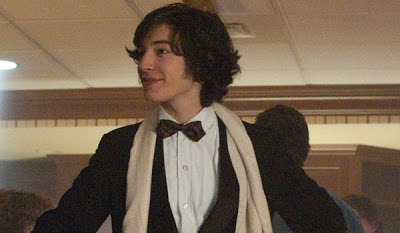 Most of the funny parts involve Patrick, and here I have something to say: Ezra Miller as Patrick could easily have stolen the show, but the fact that he didn't shows the true talent of his co-stars as well as the great character development. Everyone shone, and I think that's brilliant. Actually, I think the entire movie was brilliant. You know how you know a movie is truly brilliant? When it stays brilliant despite the numerous clumsily-censored scenes. If you haven't already, go watch Perks. I promise you, it is brilliant.